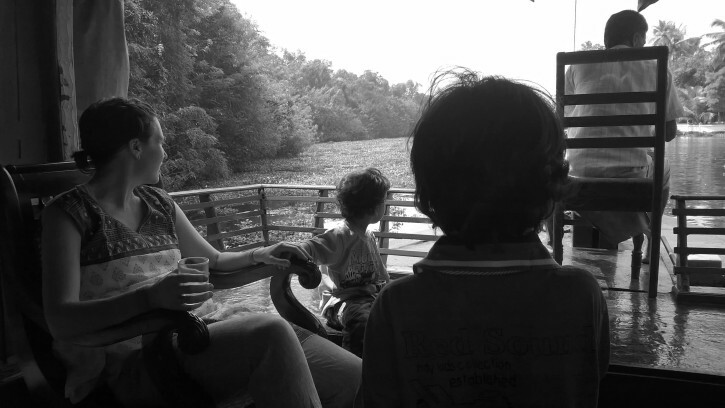 Recently my husband and I flew to India with our two young children. If anyone needed hacks for long-haul air travel with kids, it was us. I’m an anxious flyer. I used to be carefree and jet-setting, but kids, current events, and brutal slogs to the airport have changed my wing-and-a-prayer attitude. These days I would rather do anything than fly. Yet my husband and I share a sense of adventure, and travel and staying connected to family are very important to us. Our active boys are three-and-a-half and five-and-a-half. From our home in Portland, Oregon, it would take us six flights and 40 hours of flying round-trip, and our longest flight was 15 hours. I was unexpectedly pregnant and suffering from morning sickness. Our five-year-old gets motion sickness (spoiler alert: he threw up on our first flight). I share these obstacles because if we can do it, you can too. And we would definitely do it again. Our experience was vivid and soul-filling, and we were able to weather the travel challenges with a few simple tricks up our sleeves. Here are my hacks for long-haul air travel with young kids. 1. 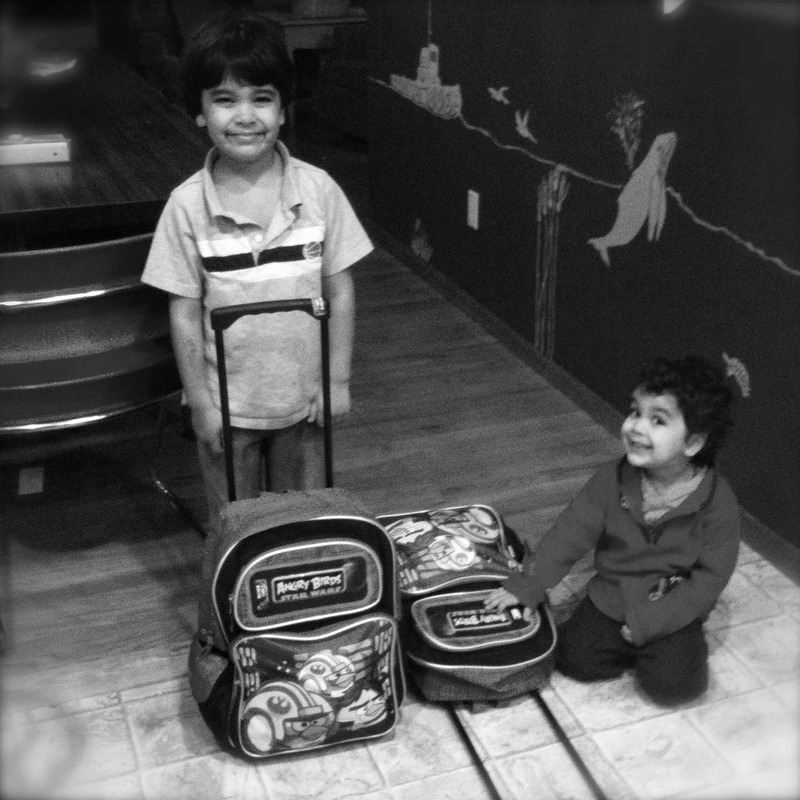 Get kids invested in the trip beforehand by letting them choose snacks and pack their carry-ons. Each child also got a special airplane “fun kit” containing a notebook, lots of loose-leaf paper, markers, and a few simple toys. When the items were assembled, each of our kids got to pack up their own carry-ons, which felt like a really important grown-up job. 2. Choose carry-ons your children can roll or carry themselves. Each of our party of four needed a carry-on for trip supplies, and sometimes the three-year-old needed to be carried himself. Having small, roller backpacks that our kids could be independently in charge of was incredibly useful. Not only did it make them feel like real travelers, but it gave my husband and me a break from needing to haul everything. When the three-year-old got too tired, it was easy to roll an adult bag and wear a child’s roller backpack. 3. Bring your own children’s headphones. 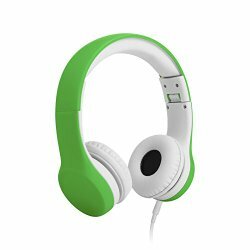 Although international flights usually have free entertainment systems and headphones for every passenger, having your own kids’ headphones is key. You can ensure that they fit well and your kids can practice with them before the flight. We also found a headphone-jack splitter (for when the kids wanted to watch a movie together) and two-prong-to-one-prong adjusters to be indispensable. Note: The children’s headphones pictured here have volume control and a sharing port built-in. 4. Don’t forget the lovies or snugglies. International travel means a lot of transitions and sleep adjustments, so comforting lovies are crucial. The trick is to triple-check that they are packed and not to lose them. I love that the stick-on labels I get from Oliver’s Labels have a free “Found-it” code so that if you do lose a lovey, it can hopefully find its way back to you. Note: A classic parent hack from waaaaay back: attach the lovey your kid’s clothing with a mitten clip. 5. Triple-check your seat assignments when you check in. Of our six flights, we only had one issue—unfortunately on the longest flight. The airline separated us into two rows, each pair in the very middle of a four-seat row. My husband had selected our seats online months before, and checked every flight before the trip, but it’s not enough to rely on that planning. Check your seat assignments again if you call the airline the day before, then again at the check-in counter, and last at the gate right when you get there. 6. Bring a carrier or stroller for preschoolers. 7. Pack plenty of food, including snackable protein. There were times when it felt like all four of us were ready to melt down (mostly during transitions between flights). Not having to rely on when we might get the next meal was important. It was really helpful to have squeezy peanut butter, pepperoni, and a protein bar or two in addition to crackers, raisins, and applesauce packets that the kids enjoyed. 8. Make sure you have wet wipes, plastic bags, and two sets of extra clothes for each child. Plan ahead for potty accidents, throw-up, and food spills. I mentioned my son threw up on our first flight. I had packed baby wipes and light towels for clean-ups, plus sealable plastic bags, but it was the extra sets of clothes that really saved us. 9. Gummy melatonin is your friend—bring plenty. I was most worried about sleep schedules on the trip, because I become psychotic when sleep-deprived. Adjusting all four of us to an opposite time zone seemed insurmountable. Gummy melatonin saved us! 10. Prepare travel pharmaceuticals (Dramamine, melatonin, ibuprofen, etc.) in a plastic pill organizer. Pack any medications you need in a container that fits easily into your carry-on. You can pick up a daily medications organizer at the pharmacy for under five bucks. I packed melatonin (children’s and adult), Advil, various morning sickness remedies, prenatal pills, Dramamine, and fiber gummies. Hopefully you won’t need everything, but you’ll have peace of mind to know it’s at-hand. For more practical advice, check out International Travel with Kids: 10 Lessons Learned by Sarah Ruttan. 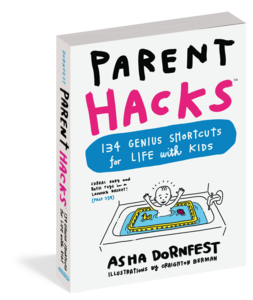 I’ve devoted an entire chapter of PARENT HACKS to travel with kids. 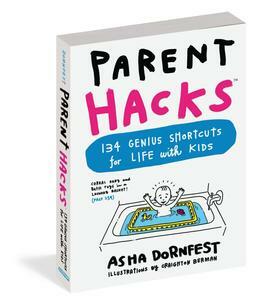 Check out the book — it’s the perfect gift for a new or expectant parent. Find out more, or order now from Amazon, Barnes & Noble, or your favorite independent bookstore. Evelyn Shoop raises gremlins in the heart of Cascadia. She is a freelance writer and editor whose work has appeared on The Daily Beast and Believe Out Loud. Find her at evelynshoop.com and momsicleblog.com or on Twitter at @evelynshoop. I want to say more about #2. (1) Giving your walking child something to drag helps focus them on getting from A to B rather than being distracted by C.
(2) These rolling bags are noisy, which means you can tell where your child is even at times you’re not looking directly at them. (3) The bags are often really really cuuuute. (We had a frog one and a duckling one.) Which makes your children more easily forgiven by strangers for whatever other air travel crimes they commit. They’re cheap, like $15, and were among the better investments I ever made toward childrearing. I want to add two items that have made our flights so much easier. Glow sticks and sticker. The glow sticks have been really great on our long haul (15 hour+) flights. The stickers are usually the cheap ones that you get 1000 for $3 and don’t stick that well, so we don’t have to worry about clean up. I refuse to give our kids a wheely bag because I usually end up rolling it. Everyone gets a backpack with 7 or 8 snacks/toys and a change of clothes, super light hoodie, headphones, a travel pack of wipes, arm and hammer scented bags and a pull up. It’s not as heavy as it sounds and fits in a Zoopack backpack. My backpack has a change of clothes for me, back up pull ups, wipes, ziplock bags, snacks, more stickers, glow sticks and crappy prize toys that we don’t mind losing. I also have 2 water bottles in there. I bring mini-notebooks, crayons, and other items to keep them entertained. We’ve done these long haul flights a few times a year, so we’re very happy the girls will sit and watch tv now, but they can still get antsy on those long flights, these items help! This is a fantastic list! On my last overseas flight, I was alone with a 5 month old and an almost 5 year old. Plus, upon arrival, our luggage was lost. My soft carrier saved me. I had a stroller, but it was slow off the plane on arrival, so the gate agent told me to go through passport control without it. I would not have managed without that carrier. Plus, as soon as we got the stroller at baggage claim, the 5 year old had a comfortable place to sit, and the 5 month old kept sleeping in the carrier. Now that the 5 month old is almost 2.5, I still use that carrier, and still won’t take a flight without it. I put the extra clothes for the kids INSIDE clean plastic, sealable bags, so that when the dirty ones come off, they go straight into the bag the clean ones came out of. I also throw a tiny plastic bag in the bottom of my backpack with a t-shirt and underwear for myself. This means that if I’m involved in the kid’s mess, I don’t have to smell that mess on myself for the rest of the trip. And if they lose my luggage, at least I have *something* clean! I keep a single diaper change kit in a plastic bag. One diaper, wipes, and the changing pad. I grab that, and a change of clothes bag, then I don’t need to juggle a big bag inside the tiny airplane bathroom. When done, I put another diaper from the stash, into the plastic bag so I’m ready to go the next time. ASK FOR and ACCEPT OFFERS OF HELP. Especially if you’re traveling alone with kids, ask for help whenever you need it or whenever you think that it *would be nice*. This could be asking the flight attendant to accompany a young child to the bathroom (and standing guard at the door because the kid is too scared to lock the bathroom door), asking the random person in the seat next to you to pull down your carry on, or accepting someone’s offer to carry your bag (or that of the older child) off the plane while you juggle the child in the carrier and hold the hand of the very sleepy older child. Moms with older kids are often *very* willing to help you out. Sometimes their teenage kids are too! Also, pack as light as possible for the airplane. This topic is clearly close to my heart! Thanks for sharing!!!! This is a great list. We live in Singapore but home is Ohio, and it’s a full 25-32 hour trip there, and then again on the way back, 1-2x per year, with 2 kids! Can’t believe it’s never occurred to me to buy the kids their own headphones before, but we’re definitely buying the ones pictured before our next trip. A couple of other tips — bring at least one extra shirt (with built-in bra) and a small, squashable pair of pants (and underwear) for yourself in addition to the 2x outfits for each kid. Guess who’s likely to get thrown up on in the event that your little one does vomit? Or whose lap they’re going to spill their orange juice on? (Another tip- bring their own non-leaky waterbottles and have the stewardess fill this up instead of giving them a cup of water. If they do want juice, either ask the stewardess to fill the cup only half or drink half yourself before giving it to your child, and then make sure they finish it ASAP so you don’t have it lingering, waiting to get knocked over). If your child is still in diapers, bring at least 1 diaper per every 2 hours of travel, and maybe then some. Especially in winter time, there is a chance your flights may be delayed, or cancelled, and you may be spending several extra hours in the airport, or even the night in an airport hotel. As for mealtimes, for whatever reason (sleeping kid, kid needs help eating their own food, whatever), you can always ask the stewardess to set a meal aside and bring it back at a later time. Also if you choose a special meal for yourself (who doesn’t need a low-sodium, or low-fat meal? ), it will be served before everyone else’s, and you can also get a headstart and beat the queue on the post-meal toilet trip. We actually find our kids much better behaved on the long trips home, as they get much more concentrated attention than they might at home. It’s really not that bad as long as you are properly prepared! Happy travels. PS- one more tip, when booking your seats. If you have a family of four, and there are seat rows of 3, try to book an aisle and a window seat right in front/back of each other, leaving the middle seat empty. Those middle seats will be the last to book. Best chance scenario, you get 2 rows, 6 seats for 4 people. Worst case, you let the middle seat taker decide whether to switch you for the window or the aisle and you only have your 4 paid seats. Thank you for these fabulous tips, Ruth! For long trips, what kind of travel clothes do you buy and from where? I try to stay away from “travel clothes” as they are often really expensive, especially for kids. But I am willing to spend on a good, comfortable rain jacket. I’ve had good luck at REI. Also good: thin, sturdy, cuffable pants with pockets. REI, Old Navy, both have been good for that. Jeans take *forever* to dry.